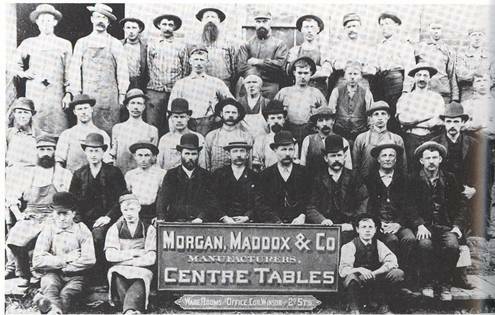 The Maddox Table Company began operation in 1898. It ceased operation around 1985. It was founded by William Maddox, son of an English immigrant, who invented a variety of furniture making machines, , which he sold to manufacturers throughout the United States. Mr. Maddox owed much of his success as a table manufacturer to his invention of a machine for polishing wooden table tops. As late as 1900 however, the principal machines in the furniture factories were slash saws, band saws, planers, moulders and shapers, and many operations continued to be done by hand. It was the mechanization of the industry and the fact that many of the Jamestown companies were small operations unable to afford to update, that lead to the demise of the industry in Jamestown. One of the first furniture manufacturers in the United States to trademark his products, in 1898, Mr. Maddox sent a showman named Cedarine Allen on a world-wide promotional tour to Great Britain, Spain, Egypt, Arabia, Ceylon, Malaya, China, and Japan. In 1919 the Maddox family sold its table making business to the Shearman Brothers Lounge Company. In 1978 the company was again sold to the Crawford Furniture Manufacturing Company. Some of this information is from an article by Paul A. Spengler titled The Furniture Industry, published by the Fenton History Center in Our Town Magazine, Vol. 1, Issue 7.